I was not at last night's Michigan football banquet in Livonia, but from what I'm hearing, it was quite the emotional love-fest, and an awkward one at that. Audio of the speech here. 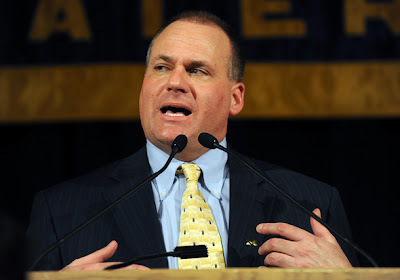 LIVONIA, Mich. -- Michigan coach Rich Rodriguez fought back tears, talking about the toll his job has taken on his family, and used passages from the Bible and a Josh Groban song during an emotional address that closed the team's banquet. With many members of the 1985 Wolverines team and dozens of other former players in attendance -- but not Stanford coach Jim Harbaugh -- Rodriguez called for healing among a fractured group of alumni. “I came here three years ago, leaving my comfort zone, because I thought this was a great opportunity,” he said. “… I knew after being on the job for a few months there were going to be some challenges. And more come out in front of us. We never ran away from it. As speculation regarding his job reached a crescendo in recent days and weeks, Rodriguez talked openly about the toll the uncertainty has taken on his family, coaches and players. He read the first verse of lyrics aloud. “This may seem kind of cheesy or sappy or what have you, but I’ve been listening to it the last few weeks, and it kind of fits the mood of what we’re in right now,” Rodriguez said. Speakers in the ballroom then played the song for the team’s 21 departing seniors and several hundred others gathered in the ballroom. As the song concluded, Rodriguez grabbed the hands of his wife, Rita, and the night’s emcee, Frank Beckmann, and raised them above his head. Several seconds passed before others on the dais, including Brandon and the entire Wolverines team, followed suit. Rodriguez, who choked up during his address, ended things with: "My name is Rich Rodriguez. I'm honored to be the football coach at Michigan. I hope you realize I want to be a Michigan man." And I thought Jim Harbaugh not showing up to the banquet would prevent awkward moments. He needs his boss, Dave Brandon, to make a decision on whether or not he'll return in 2011. Letting this drag on until after Michigan's bowl game doesn't serve the current players, the coaches, the verbally committed recruits or the fans. Michigan simply shouldn't have to endure another month of this. If Brandon wants to fire Rodriguez, do it and let him pursue other options like the Miami job, where he'd be an absolutely fantastic fit. If he wants to keep Rodriguez for another year, make the announcement and deal with the assistants later. Forget saving money or being courteous to potential replacement candidates like Harbaugh. This is Michigan. This is big-boy football. This is the time when major decisions are made. If protecting the Michigan brand is paramount, as Brandon always says, he needs to step up and settle things. Could not possibly agree more. Maybe I would feel a little different if I were there, and maybe I'd still be drunk from all the Kool-Aid, but I wasn't there, and I drank no Kool-Aid. This event, at least from the way it's been described, was a disaster. It's becoming clearer the longer Brandon lets this thing drag out, the uglier it's going to get. Rodriguez clearly doesn't even know his own fate at this point. If he did, and he knew his job was safe, reports from the last night's dinner would have painted Rodriguez in a much more resolute picture. AND...now it's being reported that the jewel of Michigan 2011 recruiting class, Dee Hart, has re-opened his recruitment, likely in favor of Alabama. I doubt last night's kumbaya session had anything to do with it, but the uncertainty of Michigan's coaching future probably did. The longer Brandon holds out, the worse things are going to get from a recruiting perspective. I understand that he wants to maintain his control over the situation...but at what point does it become a burden? I respect that Brandon wants to wait until after the bowl to make an evaluation, he's said that for the past couple of weeks as the heat has been turned way up under Rodriguez. If Rodriguez is going to be the coach in 2011, then I for one just say come out and declare it. Let everyone know, especially recruits, that Rodriguez is either your guy, or he's not.